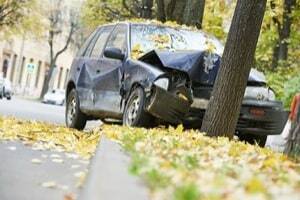 Usually, when we talk about car accidents, we think of them as involving more than one car. Whether a collision or a rear-end fender bender, it is true that most motor vehicle crashes involve more than one motorist. Yet there are a number of ways a deadly accident can occur with just one vehicle involved and these accidents are just as devastating as those involving multiple vehicles. Are Single-Vehicle Crashes Lead to Large Settlements and Verdicts? Who Pays These Settlements and Verdicts? Examples of Settlements and Verdicts Reached in Single Vehicle Crash Cases. Single vehicle crashes can happen in a number of ways. A car’s faulty design may cause it to overturn, or the road may have dangerous deficiencies that cause a car to lose control, or an object may be negligently placed near the road causing a collision. In 2007, 59% of fatal crashes involved only one vehicle, as compared with 33% of injury crashes and 31% of property-damage-only crashes. These crashes pose an especially significant risk for young drivers who often travel fast and drive in a distracted manner. Among drivers ages 16-19 involved in fatal crashes in 2008, 49% were involved in single-vehicle crashes. As the statistics show, these types of crashes are extremely serious. crashes where our clients were run off the road. The latter usually involves phantom vehicles which are cars that either flee the scene or never even know that their malpractice caused a collision in the first place. 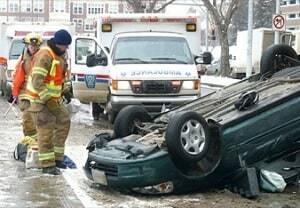 An SUV turns over due to a faulty roof or tire design, causing severe injuries to the occupants. A car hits an unmarked divot in the road that causes the car to lose control and crash into a concrete wall. A light fixture that has fallen over and obstructs a lane of traffic causes an unsuspecting vehicle to collide into it. How Could a Single Vehicle Crash Happen in Real Life? On a summer night, Mike is heading home from work. It is an especially breezy night on I-495 outside of P.G. County. The traffic is relatively light. Mike cruises down the highway in the left lane of traffic, going the speed limit and watching out for all other cars on the road. As he approaches the exit he takes to get home, he notices a dramatic increase in the velocity of the wind. He feels his car shake a bit, which momentarily distracts him, but he quickly re-focuses on the road. As he can see his exit, he all of a sudden sees a huge structure coming down on his vehicle. He accelerates and is able to avoid the brunt of the impact but the structure still lands on the back of Mike’s car and the impact causes him to lose control and smash into the concrete divider. Mike can’t tell right away, but the structure that came down on his vehicle was a light pole that had not been adequately secured to the ground to withstand a windy day. Mike’s car is absolutely totaled and he has two broken legs and a broken collarbone. Mike is airlifted to Maryland Shock Trauma where he barely escapes having his leg amputated. The county who affixed the lights to the ground should be held liable for their negligence, which caused the light pole to fall and severely injure Mike. Who Pays Verdicts and Settlements in Single Vehicle Crash Cases? 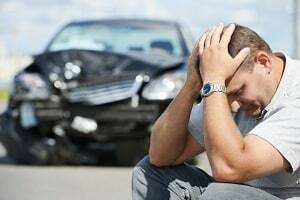 In order to pursue a claim in a single vehicle accident case, the injured motorist must be able to show that someone is at fault for those injuries. That means that someone’s negligence caused the accident. If a single vehicle crash occurs due to the vehicle’s poor design, it would be the manufacturer’s fault. If a single vehicle crash occurs, as in the above example, due to faulty roadside structures affixed by the county, then the county is at fault. If the accident was caused simply by the victim’s own poor driving, there can be no claim. But, if there is a passenger injured in a single-vehicle crash where the driver was at fault, that passenger can pursue a claim against the driver. (See Maryland $505,000 Verdict, below). Maryland: $8,000,000 Verdict. Our client's son was killed in a single vehicle crash. He was a passenger in a car. He and his friend left a nightclub in P.G. County. His friend lost control of the car and crossed the center line, hitting a bus head-on. He died instantly. Miller & Zois brought a wrongful death and survival action lawsuit and the jury found for the victim's mother on both claims and awarded $8,000,000. The defendants were the driver and Allstate. Maryland: $505,000 Verdict. Plaintiff was killed in a single vehicle accident in which the vehicle left the roadway, overturned, and struck a tree. At the time of the accident, plaintiff was a passenger in the vehicle, which plaintiff claimed was being driven by Defendant Shanon Washington. Defendant Washington denied he was driving the vehicle, but the evidence was presented at the civil trial that Washington pled guilty to charges of manslaughter in relation to the accident. Both parties were under the influence of alcohol at the time of the incident and they were both uninsured. California: $2,280,000 Verdict. This action arose out of a single vehicle rollover accident which happened when the driver was removing his jacket and seat belt and lost control on the San Bernardino Freeway. During the multiple rollovers, the van's fiberglass roof popped completely off. Three unbelted passengers were ejected and sustained serious injuries. The driver was killed. Three other belted occupants sustained minor injuries. The suit was brought against General Motors, the original manufacturer of the vehicle, and against Camino Real Chevrolet, the seller of the van. The plaintiffs' additionally brought suit against the Starcraft Automotive Corporation, which had converted the General Motors Chevrolet van following its sale. Florida: $2,000,000 Verdict. A 41-year-old female died when involved in a single vehicle accident. The plaintiff alleged that the defendant tire company failed to warn not to mix radial and bias tires, and failed to give notice of the dangerous condition that could arise from doing so. The defendant contended that the decedent was negligent in not noticing the warning in the owner’s manual of the vehicle and that this was the sole and proximate cause of the decedent's accidental death. The plaintiff succeeded in her claim. Single vehicle crashes are deadly and dangerous. If you have been the victim of one of these crashes, you deserve an attorney who will fight for you to receive maximum compensation. The attorneys at Miller & Zois are dedicated and highly qualified with experience in all types of serious accident cases, including single vehicle crashes. Contact us immediately at 800-553-8082 or get a free case evaluation online.